The days of driving to your guitar lessons every Tuesday and Thursday day are finally over. Yes, you read that right. If you were not aware, you can learn almost anything online including how to play the guitar. Times are changing, and the generation of learning things via the internet is here and going strong! If you want an EFFECTIVE method to gaining some skills playing the guitar, online is the way to go. You can learn any song, on any style of guitar. Whether you are a complete beginner or just want to sharpen up your current skills. You are probably wanting to know what is the best online guitar lessons course or program available. Truth be told, there’s a few options out there but the absolute best one is the Guitar Tricks online guitar lessons. Now, I’ll still be sure to mention the TOP TWO I recommend which offer free trials for 1-2 weeks for guitar lessons online, which should give you PLENTY of time to gain whether it’s something for you. I’m going to dive deep into each online learning resource to thoroughly review. Whether you are looking to learn guitar lessons online in acoustic, electric or bass, this will apply to you equally. It all comes down to being provided coaching that makes you exceed your own expectations as to what you can do with your guitar. No amount of YouTube can provides the structures necessary for fast learning, unlike these online programs. It comes to no surprise that Guitar Tricks is here, after all, it’s the leader in the industry for online courses to learn guitar lessons. It’s a top recommended source for a few good reasons, one of which the thorough training. I’ve been trying a few other close competitors and no one has matched the videos in terms of easy of understanding and following as Guitar Tricks. Heck, they are so confident that they give you a free trial without asking for a credit card (now that’s confidence). The top rated players which you admire, barely ever stopped practicing. They all started somewhere, with Guitar Tricks it’s easy to get the practice you need. This what they are best at. Did you know Guitar Tricks was one of the first TRUE sources to pioneer online lessons, way back in 1998… that’s 20 year ago (as of 2018). In 20 years ,they managed to have a library of more than 10,500+ lessons and more than 500 songs. Their instructors are TOP-CLASS, with some of the best guitar masters ever! Today, many people resort to watching hours of YouTube to learn something. While that may be affective, it isn’t usually enough to create success in this area. Right here, the courses are set-up in an easy to follow arrangement, ensuring you are learning, and having fun at the same time. Even those beginners who want to learn to play guitar online but have NEVER touched one before, are getting success following the step-by-step videos. What’s great about this program, is that it’s designed for EVERYONE… and I mean, everyone. Whether you are just getting started and hav yet to learn how to tune a guitar, have some skills but want to improve, or are a legendary expert who wants to learn something just for fun… this is it. Each music genre has a different style of playing, whether it’s bluegrass, country, classical, jazz, metal, heavy metal, of just freestyle. You won’t be getting bored any time soon, they add new lessons CONSTANTLY. 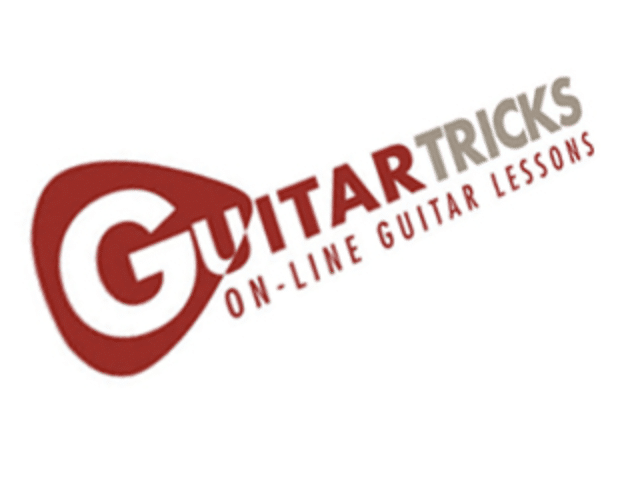 Guitar Tricks is one of the best programs for learning, especially for beginners. Hands Down. And I’m not just the one saying this, nearly everyone agrees. It can be easy to get bombarded with resources promising what Guitar Tricks has so far, but if you are looking to learn the guitar properly… stick to this program. While it CAN be fun playing on your phone or tablet with these useful guitar learning apps… none provide the same amount of structure required as the dedicated video lessons you’ll find here. There’s nothing negative I have to say about this, and I tried looking hard. Get started with a 100% FREE 2 Week Trial by clicking here. The second recommendation I have for you, is to sign up with JamPlay. There’s a few GOOD reasons why you should. First off if you are in need of really good quality guitar membership training, the kind of training where you can start at the very beginning and progress to intermediate and later advanced lessons, JamPlay is for you! Be sure to read my more in depth review of Jam Play. To be honest, this and Guitar Tricks are neck to neck… but we can’t have TWO #1’s. So we placed JamPlay safely into the number two spot. Here’s some KEY highlights of JamPlay. This number of virtual lessons took years to develop, today in 2018 it will take you a LONG time to get through them all. In fact, they add new ones throughout the year as the community continues to GROW. Learning to play guitar online now is much more useful with high resolution instructional videos. The teachers, instruments, notes, and audio are easy to understand. With this advancement in quality, you can learn to play in a noticeably shorter period of time (given you practice frequently). What JamPlay does well, is offer 3 phases of lessons, in addition to an entire songwriting section. If you’re a beginner, you’ll be provided courses with about 20 unique instructors. You also get a ton of lessons on genera specific guitar music. Practicing tabs here is literally for everyone. When you feel like you’re a part of a community, you KNOW it feels great. Here it’s no exception, in fact there’s hundreds of thousands of registered users watching their lessons. From country, classical, acoustic, rock, metal and much more. Music soothes the soul, much like Jazz. If you want to have support just moments away whoever you get stuck, JamPlay delivers. In summary, you’ll I would not blame you going with JamPlay over GuitarTricks. They are both excellent providers of high quality material for learning to play different kinds of guitar. The enormous 5000 videos to choose from (nothing comparable to YouTube), the actual quality being often 1080p+ and sometimes 4K is remarkable. As previously mentioned, those 5000 videos cover everything, any skill level needs this moment. And lastly, the large community of subscribers and coaches who are part of JamPlay make learning as easy as it will get. But again, given you are persistent and constantly practice. You can sign up for JamPlay’s Free Trial here. Now here’s something different for a change. In fact, very different in terms of how you learn. 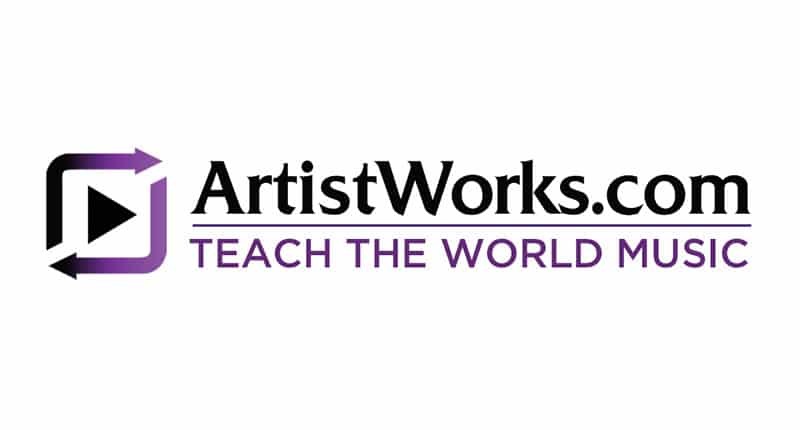 ArtistWorks.com does their online learning different by not doing a monthly membership and give access to a ton of video training courses (like GuitarTricks & JamPlay). How they work is by letting you choose which specific instructor or school you want to learn from. So for example let’s take rock guitars, you will sign up for Paul Gilbert’s program. If you want to learn bluegrass, you’re looking at Keith Wyatt’s program, and so forth. How they work, is be letting you buy a 3, 6, or 12 month membership of a specific instructor’s course.This is where they get very specialized with their approach to teaching you genre specific guitars. There’s no cutting corners in terms of quality of the lessons you’ll be receiving, each instructor is excellent and thorough with their teaching. There’s more on this in our detailed review of Artists Works. Now if you’re worried about whether you’ll like the style of teaching they will offer you, don’t be. To ensure you like what you’re learning, you can get some sample lessons which are completely free. This should give you a good indicator whether it’s for you. You’d think that ArtistWorks is more in-depth and personal about your learning, and you’d be correct. Their Video Exchange feature lets you submit a video of you playing your guitar, and let a certified instructor watch it and give you feedback. Now that’s pretty personal. *You can also see the archive of other student videos. If this kind of learning sounds appealing to you, and you can pay a slightly higher premium for it, you can sign up and start now with Artist Works. Like with all options, there’s gotta be one where you don’t need to pay anything out of pocket, and that’s where JustinGuitar comes into play. There’s no paid membership option available, it’s truly free 100%. But do keep a few points in mind, one of which is “you get, what you pay for”. Don’t expect this to be anywhere near the same quality of GuitarTricks or JamPlay or TrueFire. When you’re getting YouTube quality videos for free, there’s no comparison when it comes down to learning. Believe it or not, free does not always entail “100% free”. On one side tire’s you’re time, how valuable is it? Are you willing to spend 2-3x longer learning from not so quality lessons where as… for a small monthly investment you could learn 2-3x faster. Also, with Justin Guitar they may be free but it often leads own to courses or DVD’s. It could end up costing you MUCH MORE than a years membership with the leading providers mentioned above. Now there’s no biased here, a free option has value for sure, the primary one is the initial savings. If you’re in the position where you don’t want spend a single dollar, JustinGuitar is a good option. It may take longer to get things going… but there’s training in place to get you there eventually. 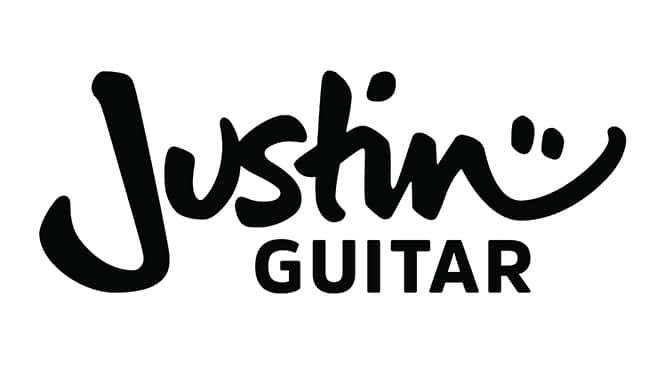 You can check out JustinGuitar here. Want to know how many online videos TrueFire online videos TrueFire currently has LIVE? It’s at around 25,000 and growing! That’s TWENTY FIVE THOUSAND video lessons. You may be wondering, wow Martin that’s great… why isn’t this the #1 pick? Well reader, I’ll tell you why. It has a lot to do with their video lessons and tutorials being catered towards advanced players. Sure they have beginner lessons to get you started, but it’s not even a comparison if you’re an amateur player for how many videos they have for this skill level. GuitarTricks & JamPlay are CLEAR winners when it comes to teaching beginners how to play guitar. Unless you have a good grasp on how to get around this majestic instrument, TrueFire isn’t for you but I put together a better review of them here. 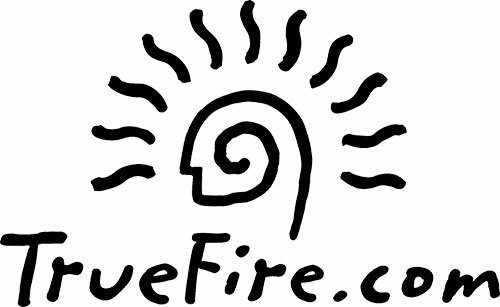 Check out TrueFire here to get things started. Alright we’re here looking into the last place source for guitar playing knowledge. This is by far the most affordable option (with the exclusion of being free), at $4.95-$9.95/month. Jamorama almost didn’t make it on this list, but I felt like it had to be because it DOES offer lessons which do actually help. When comparing it to JamPlay or GuitarTricks, the contrast is very obvious. First instance, above two superstar services constantly update their videos, upload new ones, and have a big community. With Jamorama, you’re not getting that and it’s for obvious reason. As mentioned earlier, you get what you pay for. You can easily take advantage of their free trial, if for some reason anything above didn’t work out for you. Click here to check out Jamorama. A resource not mentioned here but a worthwhile look, is Guitarzoom. This is a resource offering courses by highly skilled teachers. If you’d like to learn more, you can read our full Guitarzoom review here. So there you have it, this buyer’s guide I am hoping managed to give you a really good understanding of which online program coach to follow. The art of playing your instrument really well takes a lot of practice. No amount of software or training programs will improve if you don’t keep strumming the string. Whether you’re a kid or an adult, the top 3 reviews provided are likely to give you best results.